Just a simple article about something I recently did in my home network. I wanted to prepare the network for a Squid proxy, and design it in such a way that the client devices did not require proxy settings. Having trouble placing it inline, I decided I could use WCCP. 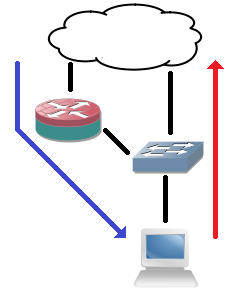 However, that requires separate VLANs. This did pose a problem: my home router did not support any kind of routing and multiple networks beyond a simple hide NAT (PAT) behind the public IP address. Even static routes weren’t possible. And again my fanless 3560-8PC helped me out. The 3560 can do layer 3 so you can configure it with the proper VLANs and use it as the default gateway on all VLANs. Then you add another VLAN towards the router and point a default route towards that router. That solves half of the problem: packets get to the router and out to the internet. However, the router does not have a return route for the VLANs. But it does not need that: you can use Proxy ARP. As the router will use a /24 subnet, you can subnet all VLANs inside that /24, e.g. a few /26 and a /30 for the VLAN towards the router, as my home network will not grow beyond a dozen devices in total. Now the router will send an ARP request for each inside IP address, after which the layer 3 switch answers on behalf of the client device. The router will forward all data to the layer 3 switch, who knows all devices in the connected subnets. And problem solved. From the point of view of the router, there’s one device (MAC address, the layer 3 switch) in the entire subnet that uses a bunch of IP addresses.